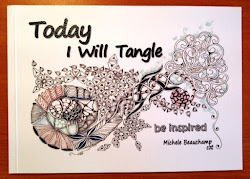 Laura's Weekly Challenge # 68, hybrid and strircles are the two tangles to use in our DuoTangle creation. Wonderful! I'm always impressed with your work. this is very interesting! 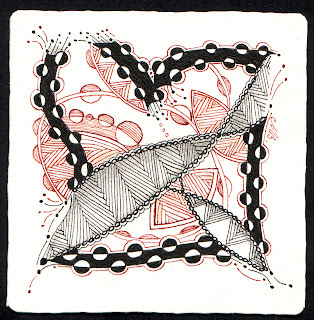 i like the black band with circles that pulls the whole design together - really nice detail! I really found your design to hold my interest, Shelly. Some pieces look like woven belts, some like metal studs along leather. I like the two colors, too. I love the string of strircles bordering the zt. The deep black makes it look formal. Great ribbons of hybrid! Wow, the is lovely. Love your use of strircle as a border. Very clever! 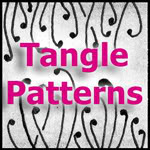 Love the dual tone, dual tangle! The auras on Stircle is very effective too. This is wonderful and love the added color in it. Super, super!! Amazing! I envy you your ability to create so many versions of these two tangles. So original! I always look forward to seeing your contributions! This is really lovely, with great balance between fine lines and bolder areas; and just the perfect amount of color! Very beautiful! Delicate... and bold. What a great combination! Lovely done. Very nice composition and a great mix of red and black.